Friday, February 2nd @ 7:00PM – Only $26.95 per seat! Rock and Soul is a re-creation of two of music’s biggest icons. 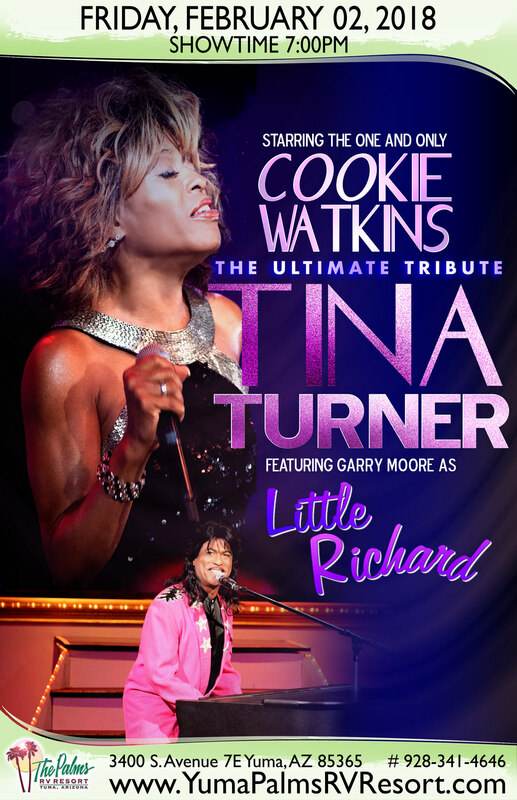 Garry Moore (Little Richard) and Cookie Watkins (Tina Turner) take you back to the beginnings of the music that shaped America in the 50’s, 60’s, 70’s, 80’s and finally the 90’s. Their Looks and sounds are uncanny. This show is total high energy with rock and roll hits such as Tutti Frutti, Good Golly Miss Molly, Proud Mary, along with that touch of soul including songs like Private Dancer, What’s Love Got to Do With It, and Send Me Some Lovin’. Garry and Cookie have toured worldwide with ‘Legends in Concert’ and appeared on multiple television shows including ABC’s show world’s best tribute. Come experience the artistry and raw talent that is Rock and Soul.